Closeup of finished transom after installation. Lauren contacted me about building a transom for her home in Hilton Head Island, SC. 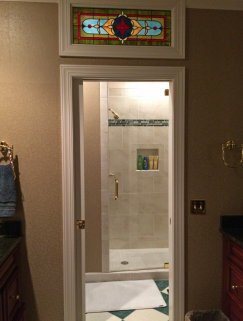 She had created a transom opening in the master bath between the garden tub area and shower area. Lauren wanted to design a transom that was very similar to a transom called Julianne's Transom that I built in 2007 for a home in New Jersey. Julianne's Transom itself was a redesign of a transom I found in a church in Greensboro, Alabama built in 1907. This is my all time favorite classic Victorian design. Because the opening for Lauren's transom was much shorter than the original design, we had to change the proportions to fit. Lauren liked many of the original colors, but we changed a few to fit her decorating plan. 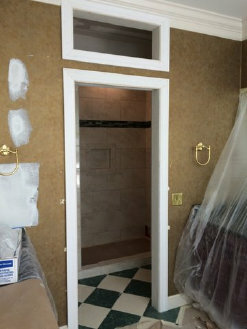 Lauren graciously sent pictures (below) after her bathroom was finished and the transom was installed. What an absolutely beautiful bathroom remodel. I particularly like the way Lauren has placed the transom between both rooms for maximum visibility. The way the light brings out the colors in the transom is near perfect! 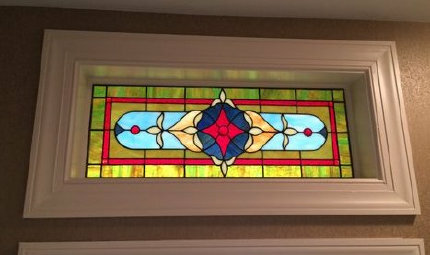 Lauren's Transom measures about 11" x 29" and contains 99 pieces of glass. It was completed in June of 2015. 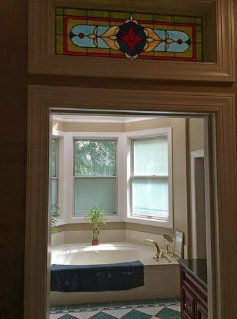 After transom installation - looking into tub area. Closeup of finished transom after installation. What a perfect installation job. Looks like the transom was built with the house!